Inflation in the EMU, in its largest economies, and in the U.K., remains subdued. While French headline inflation is still right at its most acceptable level at a 1.9% pace, its progressive growth rates make it clear that it is actually at 1.9% and falling with prices decelerating over six months and prices declining at a 0.4% annual rate over three months. Germany, the EMU member with the lowest unemployment rate, has inflation at a 1.7% pace year-over-year and also shows deceleration with three-month inflation at a 0.4% annual rate. Ex-energy or core inflation finds year-on-year inflation the highest in Germany at 1.4% and lowest in Italy at 0.6%. For all countries in the table, the core or ex-energy inflation rate is falling from 12-months to six-months and again from six-months to three-months (except for Spain where it is flat from six-months to three-months at a low annualized pace of 0.3%). These are inflation statistics even a German could love. The lingering disagreements about policy in Europe for now involve the fact that interest rates are too low and while there are still plans for raising them later in the year, no actions are being taken as of yet. 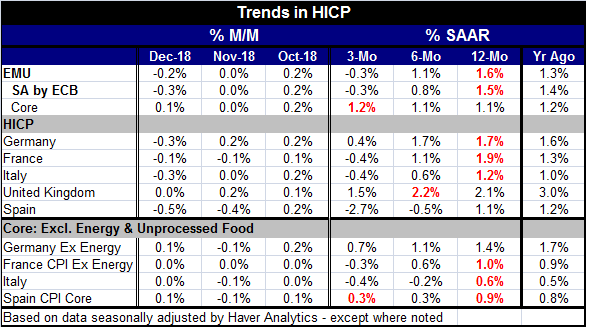 Current inflation is low substantially because oil prices have weakened again and it is oil that that been playing the headline HICP pace for the EMU at or around the 2% mark. And while late-2018 finds inflation falling, inflation is still generally higher and more stable than it was from 2014- mid-2016 when low inflation and falling prices were the bane of central banking. Over the past year or longer, core or ex-energy inflation has been quite stable or falling in the large EMU member nations with the exception of France. And for France, ex energy inflation rate has been rising more slowly. Since January, the year-over-year core or ex-energy inflation rate in the table for Germany, Spain and Italy has decelerated monthly at least half the time. That result depicts inflation excluding energy as waffling and remaining contained. It affirms that inflation being low in the core is not just the result of energy prices. Inflation in Europe is authentically low, below the ECB's target and largely decelerating. In addition to these circumstances, growth is weakening. Classically, when we worry about a weakening economy, we also worry about putting downward pressure on prices setting the stage for a further undershoot of the inflation target and possibly even raising the question of price stability issues again on the low side of target. The worst of these concerns usually do not arise if inflation is low when growth is solid. But where inflation is well below target and growth is weak, undershooting becomes a policy issue for the ECB. And there is the potential for growth instability to continue or to gather pace in the wrong direction. That is already in train to some extent. And weakness in China has led the PBOC to engage in record-breaking massive funds injections today to stabilize the economy there. This could foreshadow further weakness in prices globally because of global slowdown effects emanating from China. At this same moment, the British parliament has formally failed to accept the government's Brexit deal and policy there is more seriously adrift with separation from the EU set for March 29. But all sorts of wheels are spinning and anything is possible there from just pushing the date of succession out to arranging a new national referendum. But none of that will reassure prices. Away from the country detail inflation in the EMU is undershooting (1.6% year-on-year) and decelerating to a 1.1% pace over six months and on to a -0.3% pace over three months. Core inflation for EMU is steady at a 1.1% pace over 12 months and over six months while ticking up to a 1.2% pace over three months. One year ago, the core pace also was 1.2%. So while the headline has been battered about by oil price fluctuations, core inflation in the EMU has been quite steady, solid and low. All of that gives us a very good base from which to assess policy. Looking ahead at the inflation front, there are no problems, but looking ahead for growth, there are challenges. Since the ECB only has an inflation mandate, it is unclear how it will seek to operate in such an environment. The ECB, like the Fed, seems eager to get its balance sheet back to normal (whatever that will be determined to be). And beyond that, it also seems to be eager to get rate levels back toward normal, but it has not been able to take advantage of the past several years to raise its benchmark rate the way the Fed did. So the ECB finds itself with weakening growth and very low interest rates. Inflation is also low, but it is quite acceptable inflation for now. But since economic growth is losing momentum and may be losing its strength more sharply as we saw from the drop in industrial output, trouble could also lie ahead of the ECB. The global environment seems more challenged as well and it seems a good time to be wary of the downside. The weaker that the economy gets, the less accepting will be core inflation hovering at a 1% pace. No one wants to warn of recession especially not with interest rates so low. Moreover, in Europe, there is no policy shock to create a downturn - apart from Brexit, and that has been an old lingering worry. In the U.S., the Fed seems to be pausing from its three-year mobilization of rate hikes. But there is still weakness in the air and it's a good time to keep an open mind about how these various forces will play out.